The Copernicus Gesellschaft e.V. awards the Copernicus Medal 2017 to Antje Boetius for her pioneering work on the biogeochemistry and microbiology of ocean methane dynamics and the biogeochemical effects of retreating Arctic sea ice. 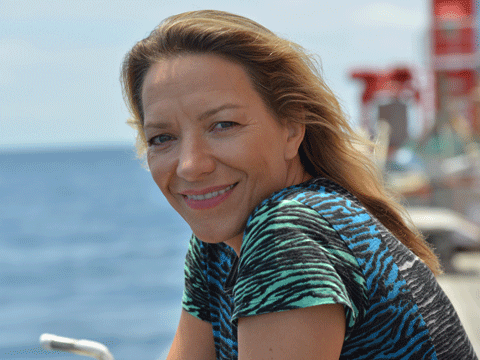 Antje Boetius is professor of geomicrobiology at the University Bremen and leader of the Joint Research Group for Deep-Sea Ecology and Technology of the Alfred Wegener Institute for Polar and Marine Research and the Max Planck Institute of Marine Microbiology. The medal will be presented during the EGU General Assembly 2017 on Tuesday, 25 April 2017, 19:00, in the Austria Center Vienna, lecture room E1 (ground floor). The medal lecture is entitled "Under the Ice – Observations of a changing Arctic Ocean". The Copernicus Medal recognizes individuals with outstanding and innovative scientific achievements in geo-, planetary, or space sciences who have also accomplished fruitful work for the promotion of international collaboration in the sciences. It is dedicated to scientists in the midst of their career. The Copernicus Gesellschaft e.V. is a non-profit society, registered in Germany, and aims to promote international collaboration in the geo- and space sciences. The society was founded in 1988 by directors, scientists, and administrative staff of the Max Planck Institute for Aeronomy (today Max Planck Institute for Solar System Research – MPS). The Copernicus Gesellschaft e.V. is the exclusive partner of the Copernicus GmbH, Meetings & Open Access Publications.